This is the Chinese New Year Parade in Queens section. 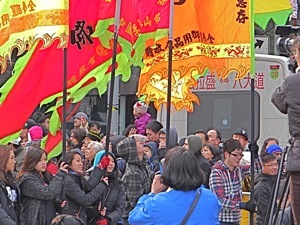 The Chinese New Year Parade and related celebrations are held annually in Flushing. The following shows our coverage of the Chinese New Year Parade & related celebrations in Flushing Queens. February 19, 2018 / Flushing Neighborhood / Queens Holidays / Flushing Chinese New Year Parade & Celebrations / Queens Buzz NYC. On Saturday I made my way east to Flushing to watch the Chinese New Year parade in Flushing. 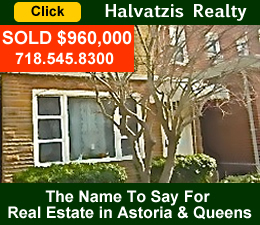 The Flushing neighborhood of Queens rivals the Chinatown neighborhood in Manhattan for the leading center of Chinese culture in New York City and along the East Coast of the United States. The photo at right shows a few of the 'dogs' celebrating the year of the dog in the Flushing Chinese New Year Parade. The parade kicked off at 11 am just east of the Queens Crossing Mall at Main Street and 39th Avenue. They headed south along Union Street, west along Sanford Street, before heading north along Main Street terminating just after passing the Queens Crossing Mall. Literally thousands participate in the parade itself and likely north of 10,000 spectators come out to watch the grand cultural celebration. Participants march in groups, dressed in traditional costumes, harking back to ancient times. And there were also many floats, which were generally associated with local businesses and organizations. 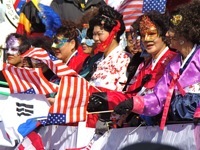 The Flushing Chinese New Year parade is an evolving cultural event as Korean and Japanese marchers and floats also participate in the parade. And in the last few years I’ve noticed westerners marching dressed in traditional costumes, possibly as cross cultural / Americanized couples and friends join in the fun. 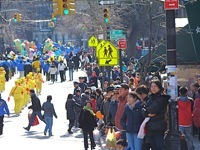 CLICK here to view our report on the Chinese New Year Parade & Celebrations in Flushing Queens NYC. The links above will provide information about the viewing times, locations and route of the Chinese New Year Parade in Flushing Queens. This report will give you a sense of what to expect when you go to watch the parade - probably the finest Chinese New Year Parades outside of China. The Chinese New Year Parade in Flushing begins at 11 am on Saturday, February 13th, 2016 and generally runs about two hours. 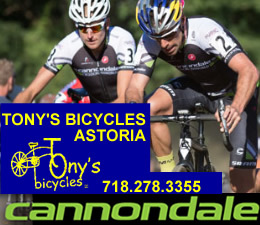 It begins at Queens Crossing Mall at 39th Street & Main Street - click the link above for the map and information about viewing locations, times and parade route. Click this link for the parade times and the parade route of the Chinese New Year parade in Flushing Queens for 2016] . FYI - in 2014 it was the year of the Horse. Weather forecast as of February 10th, 2016 for the Chinese New Year Parade in Flushing Queens on Saturday, Feburary 13th. It will be partly cloudy with the highs around 20 and the lows around 0, with 24 mph winds. Not ideal parade weather. 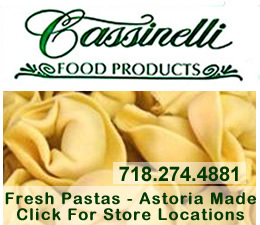 This is a report about the Chinese New Year parade in Flushing Queens on February 8, 2013. 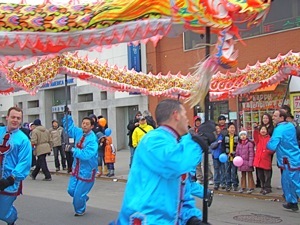 In 2013 the Chinese New Year Parade started with great weather. It was sunny and seasonably warm, with the highs in the low forties. 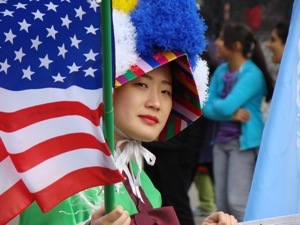 Due to the good weather and increasing awareness of the colorful cultural event, we estimate that the crowd in attendance was over 10,000 as spectators lined the entire length of the parade. Spectators lined the streets two, three and four deep. There were large congregations of spectators, particularly from the stretch along Main Street from the Queens Library to the south to the new Queens Crossing Mall at the north end. Nonetheless, due to the wide Flushing streets and rerouted traffic, there was ample room in which to move around. This year there were a number of new costumes and floats, and we recognized some costumes from the prior year as well. The better weather [last year the temperatures were in the single digits and there was a biting wind] and the larger crowds added to the theater of the parade as we were able to relax a bit more and take in the entire scene. It was interesting to observe American Korean War veterans marching alongside Korean American floats. At first this struck me with a bit of irony, but as I pondered it more deeply, it occurred to me that the Koreans marching in the parade [or their parents and grandparents] likely fought alongside these Veterans of the 1950's conflict. There were also representatives of the U.S. Census, reminding citizens to be sure to register this year as the census is used to determine the public allocation to neighborhoods, of funds for educational and social services. The Chinese American community in Flushing has begun to rival Chinatown in Manhattan as the largest concentration of Chinese in the western hemisphere. In the last census the Flushing population was estimated to be in the range of 200,000, of which about a third were Chinese. Manhattan's Chinatown is estimated to have a Chinese population ranging from a low of 70,000 to a high of 150,000. So it will be interesting to see the results of the 2010 census. The following slideshow is of the parade and may also be viewed in our photo album of this event in the Photo Albums section of the site. 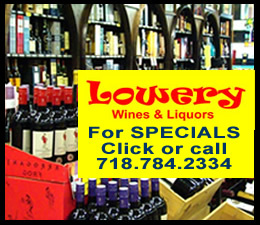 Click here to view photos of the Chinese New Year Parade in Flushing Queens or view them on the slideshow below. February 6, 2012 / Flushing / Ethnic & Religious Culture / Queens Buzz. I attended the year of the dragon Chinese New Year Parade in Flushing on Saturday, February 4th. It’s easily one of the best Queens parades because the Chinese and Koreans put a lot of effort into a sensory pleasing, cultural mélange, that includes beautiful costumes, melodic music and aesthetic theater. Thousands participate in the parade, which first began in Flushing in 1997. In 2011 the parade starting welcoming non-Asian participation, and hence last year it was interesting to watch someone of mixed ethnic descent, run as one the leads of one of the dragon dance teams. The dragon dance teams in the Flushing New Year Parade vary, as in China, from a two member team to as many as ten or fifteen. Legend has it, that the longer the parade dragon, the greater the luck for the year. 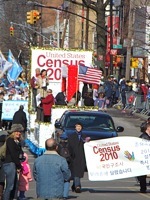 Click here to read more about our report and view photos of the Chinese New Year Parade 2012 in Flushing Queens. January 25, 2012 / Flushing / Ethnic & Religious Culture / Queens Buzz. I attended the opening ceremony at the Flushing Town Hall celebrating the Chinese new year. Flushing Town Hall is a neighborhood and Queens borough cultural center, which has easily become one of the leading places in Queens and NYC, where one can familiarize themselves with authentic Asian cultures. Flushing Town Hall presents many exhibits and programs, which nurture an environment of cross cultural understanding. 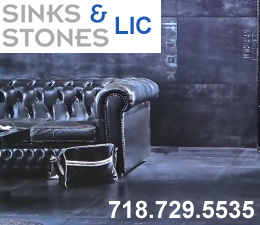 They are also an important location for innovative theater performances, jazz, and world music, of which you can read more about by using the search function on this site. One of the reasons for Flushing Town Hall's emergence as an Asian cultural center is that Flushing is the home to the largest Chinese community in New York, equaling – if not surpassing - Chinatown in Manhattan. And New York City is home to the largest Chinese community outside of China. This year is 2012 AD in the western world, but to the Chinese this is the lunar year 4709 and the year of the lucky dragon. 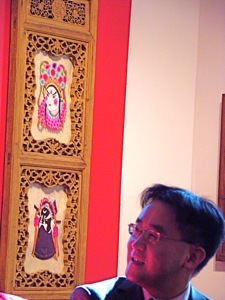 Steve Chen of Crystal Window & Door Systems in Flushing [current exhibit sponsors], speaks about the Antique Chinese Windows and Doors collection currently on exhibit at Flushing Town Hall. 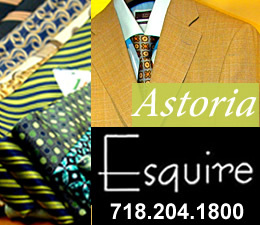 Click here to read more about the upcoming Chinese New Year Parade 2012 in Flushing Queens and Chinese Culture. Flushing / February 10, 2010. 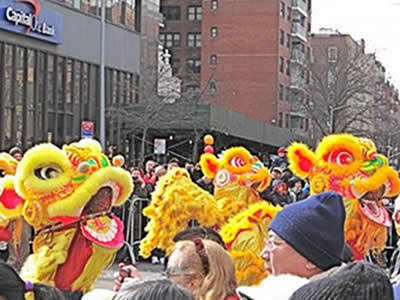 This story includes links to current info about the Chinese New Year Parade in Flushing 2010 & 2009. It also includes reports about the parade in recent years to provide you with a sense of what to expect as well as a link to a story providing viewing times, locations and Chinese New Year Parade map. The stories include photos of the Chinese New Year Parade in Flushing Queens which showcases a mix of costumed parade participants as well as the large crowd. Generally there are in the neighborhood of 10,000 people who come out to see the Chinese New Year cultural extravaganza in Flushing. 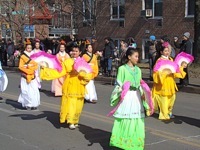 The parade was followed by a number of cultural events given by both traditional Chinese and Korean performers. 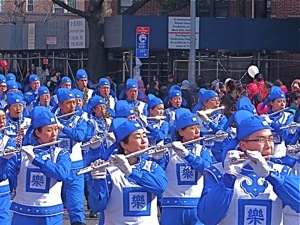 Click here to read our reports about the Chinese New Year Parade in Flushing, including a slideshow and photo album.